If you listen carefully, you can hear the sounds of a thousand book bloggers' heads exploding as we each attempt to come up with a single favourite. Part of me wants to pick Charles Arrowby from Iris Murdoch's The Sea, The Sea because he is such a complete knobhead (and very entertaining with it), and part of me wants to pick Lady Sybil Ramkin from Terry Pratchett's Discworld novels because she makes me feel better about myself, but this book caught my eye when I was picking best opening line (and would have been a winner for best opening paragraph). 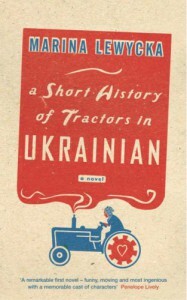 I pick Valentina from Marina Lewycka's A Short History of Tractors In Ukrainian. She is a glamorous blonde Ukrainian Divorcee with whom the narrator's 84-year-old father falls in love. She explodes into the narrator's life "like a fluffy pink grenade", sits on her finacee's lap and lets him fondle her "superior Botticellian Breasts"; she wants a new life for herself and her son, an education for him. She is wonderfully awful and it's a fantastic book.